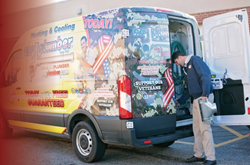 With Memorial Day quickly approaching, and May being Military Appreciation Month, My Plumber Heating and Cooling launched its annual campaign to promote awareness and raise support for American veterans and their families. A fleet of specially wrapped My Plumber Heating and Cooling service vans and trucks are traveling throughout the Washington DC Metro area every day, bearing a camouflage design, an awareness ribbon, and service seals to represent the five branches of the US military. A portion of all profit earned is donated back to local organizations that support the cause, including Serve Our Willing Warriors. As the Washington, DC metropolitan area’s go-to plumber, My Plumber Heating and Cooling recognizes the vital importance of community involvement; in addition to promoting awareness, the company is proud to have sponsored and donated to the local lacrosse league, BattleLax’s Shootout for Soldiers campaign. This is BattleLax Lacrosse’s second year participating in Shootout for Soldiers - Baltimore. Last year they sent just one U13 Boys team and had a great experience! This one team raised an incredible $6,290 which ranked them as the top fundraising team in the tournament. In 2016 they are sending two teams, a 2019 Girls team and a 2021 Boys team! With these two teams BattleLax hopes to beat our overall fundraising for last year to benefit our veterans! Please consider supporting a BattleLax team in this event and the veterans that have sacrificed so much for our freedom. My Plumber Heating and Cooling is committed to being the company of choice for our customers’ Plumbing, Heating, and Air Conditioning needs. We strive to exceed the expectations of our customers on every visit. We value our employees in an effort to make our company the best, inside and out. We respond to our clients’ needs diligently, quickly and honestly, with the highest regard for customer satisfaction. This is why My Plumber is an unchallenged benchmark for quality, experience and rock-steady professionalism in our industry. For more information, visit http://www.myplumber.com.